Soft, supple and durable, the Daisy is a fun yet practical ballet shoe. 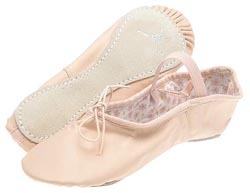 Perfect for dancers of all ages, this ballet shoe is made of soft, durable leather and comes in a shade of ballet pink that goes perfectly with Capezio ballet pink tights. Available in adult sizes 3-10 with medium (standard) width.